State is just a simple storage and retrieval mechanism of chunks of configuration based on keys. As such, although the chunks might look like configuration: they have no particular life cycle or behavioural complexity; they aren't meant to be exported through an equivalent of configuration management; and they are stored in a simple way. As a consequence of these differences, state is also fundamentally differently from configuration in its PHP. Whereas configuration uses config entities, which provides configuration with a lifecycle, including long-term persistence and caching, state uses a key/value store, and must therefore implement its own caching strategy. State implements its own simplistic caching using protected object variables, which means it only lasts for the duration of a PHP request. This is understandable if we consider: on the one hand, a request to a database-level cache will be no quicker than a request to a database-level key/value store; on the other hand, a more complex caching strategy will still be about as volatile as uncached state is anyway. 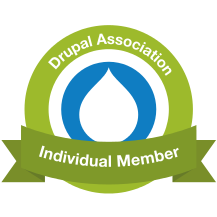 Drupal has a more generalized key/value store, which is partitioned into collections, and code should ideally only ever modify one collection for its "personal" use. Of these collections, state API's is called 'state'. This means state only sees its own key/value pairs, not those of potentially other parts of Drupal core or contributed code. Both state and the key/value store are provided by Drupal as services, capable of dependency injection as discussed previously. Although we use the raw \Drupal::service() call in the examples at the very end, this is because we're running them from the command line: all the classes we save will use dependency injection. Similarly, setting and deleting state proceeds via setting and deleting items in the key/value store. In addition, because state doesn't use entities, then state values have no "identity", which means that updating and creating both use the same "setting" operation. * Run some state API tests. *   State service, injected into the new object. *   Key/value factory service, injected into the new object. // Replicate the key/value store that state itself uses. * Write a new state value; read it back. * where the collection is "state". print "Previous value for custom state: "
* Write and read state; meanwhile, change via key/value. * cached data in state. // Set a value through state, which is cached. // Set a value directly into the key/value store. // State still has the old, stale value. // Clearing caches fixes this. Provides compatibility with dependency injection, to obtain both the state service and the key/value factory service. 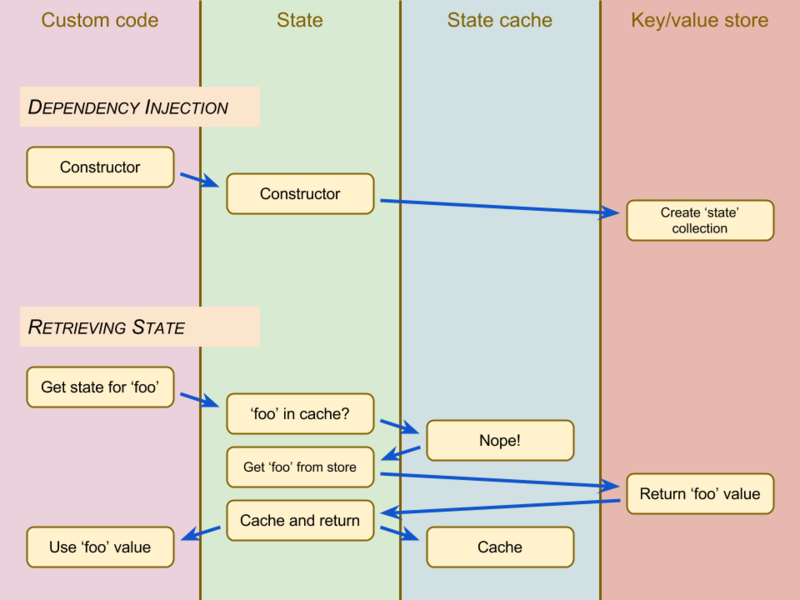 Shows how state uses its internal cache, by also creating a custom key/value store to interrogate the 'state' collection directly, bypassing the cache. Note that, whereas services inject the state directly into the constructor, a factory is provided for key/value objects. This permits state to use the factory to obtain a 'state' key/value collection, and other classes to do the same with their own custom collections, while minimizing the number of services subsequently required to just one. As previously discussed, you should have Drush installed, and we don't cover that here. To run the two test methods in turn, you need to a) initialize an object of your new custom class b) inject the relevant services while doing so and then c) call the method. This provides the class with the two relevant services. However, you'll need to call a method to obtain any output, as we'll show below. Setting custom state to: ['time' => 1480328225]. Setting custom state to: ['time' => 1480328237]. The state is being set with a nonscalar value (an array with a single element "time"), and each call first retrieves the state from the previous call, before updating it. The first line is the result of modifying the data in the key/value store, but state has still cached the stale data; the second line shows state having cleared its internal cache and picking up on the changes. If you see all of the above then congratulations! you have successfully manipulated state, and its underlying key/value store and cache. Thanks for the writeup on KeyValue in D8! There's nothing mentioned currently in the docs, and I was curious what the difference was vs the State API. Very helpful! A pleasure! Glad it was of some use.